I'm having a problem with blisters on my LEFT foot from walking. Looking at my left foot, it appears that something is pushing my 2nd and 3rd toes apart, causing blisters where they rub on adjacent toes when I walk. So I bought some of those Injinji toe socks, and they helped the rubbing of my 1st and 2nd toes. But yesterday when I walked I got a blister instead on the 4th toe, evidently where the 3rd toe pushed against it, and I was already wearing the toe socks. Arghh! It does seem like the ball part of the bottom of my left foot just proximal to the middle toes is a little bigger in volume than on my right foot. It looks like to me that my 2nd toe is being pushed toward the great toe, and the 3rd toe is being pushed against the 4th toe. But I don't really have any toe pain or numbness, just this irritating problem with blisters that appears to be worsening. I didn't used to have any blister issues or crooked toes, and the toes on my right foot look fairly normal (except for some joint enlargements which I presume are arthritic in nature). Some informative reading makes me suspicious that this could possibly be a developing Morton's Neuroma, however I don't really have any foot/toe pain or numbness, just the toe alignment problem. 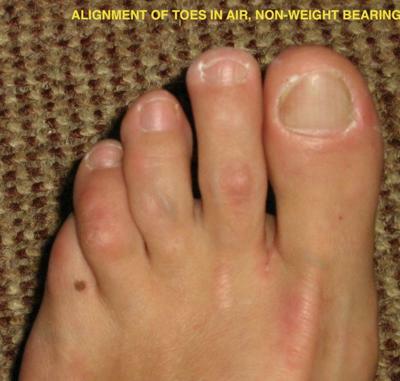 Is there any kind of special orthotic or device I might use on my left foot to get these toes aligned more properly when I walk, or do you think it would be wise to pursue medical treatment at this time? I really need to walk, I have glucose intolerance and metabolic liver, and I feel much better when I walk. 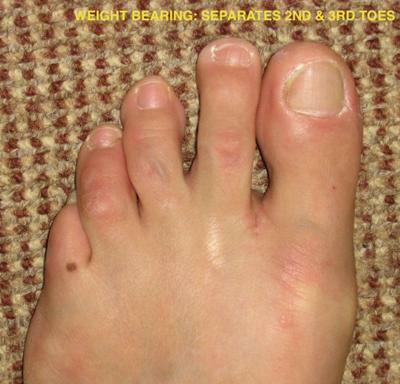 Attached are 2 pics, one is non-weight bearing and the other weight-bearing to show the difference in toe alignment when I bear weight on the left foot. Unfortunately, I have to concur the you may have a Morton's neuroma or perhaps an intermetatarsal soft tissue mass of some sort. When you step down, the growth is pushed in between the metatarsal heads and thus you get the spreading of the toes. An orthotic would probably tend to exacerbate the problem. My suggestion would be to first find out what is causing the problem, if it is benign and does not hurt, you can then leave it alone. If that is the case then you can play around with various walking shoes and "toe" devices to keep the toes from rubbing together. If for some reason the growth were considered questionable, then you would have to have it removed.